Did someone comment that it would be okay if I posted more pictures of my peonies? 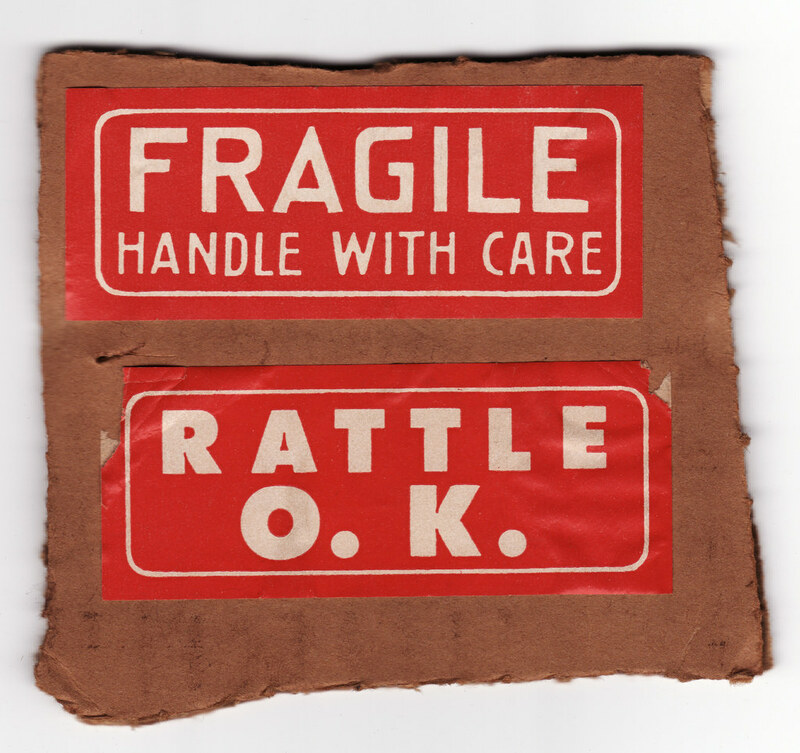 That’s good, because I fully intend to. 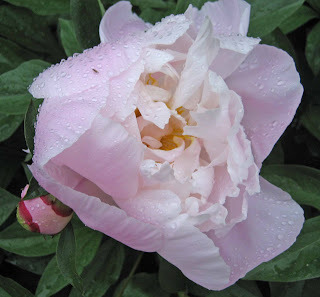 Did you know that the peony (Paeonia) is the state flower of Indiana? 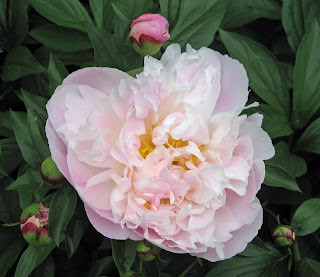 Yes, even though the peony isn’t a native flower, (it’s from Asia) the Indiana General Assembly voted in 1957 to make it the state flower. Before that, from 1931 to 1957, the state flower was the zinnia. The zinnia is also not native to this area of the country, so being a native flower clearly isn’t a requirement to be the state flower in Indiana. I think the reason the peony is our state flower is because nearly every old farm or house has some peonies blooming in the yard. It’s a very long lasting perennial and it’s easy to dig and divide and share with others in the fall. My favorite peony is the unnamed variety that my Dad grew in his garden. I rescued them about six years ago and planted them in my garden. It’s the peony you are about to see pictures of below. 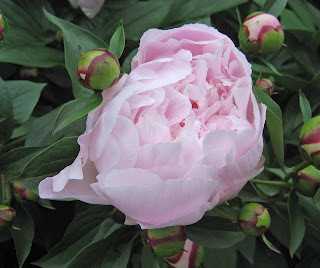 I do have some store bought peonies, too, but they are slower in blooming, and to me they aren’t as pretty as these. One is white, the other dark pink and they don’t have as many petals as this one I got from my Dad’s stand of peonies. My personal, unbiased opinion is that these peonies are particularly big and beautiful this year, probably because we’ve had plenty of rain and a cool spring. But they could be even bigger if I had removed the side buds a few weeks ago. My Dad always removed the side buds on his peonies so just the main flower bud on a stem bloomed. He showed us how to do it so we could help. As a result, he’d have peony blooms as big as our heads for us to take to our teachers. And some years we would cut the peonies to take with us when we visited our grandparents on Memorial Day weekend. Then we’d tour through several different old cemeteries and leave some peonies at the gravesites of greats and great-greats and great-great-greats while getting a lesson on our family history. 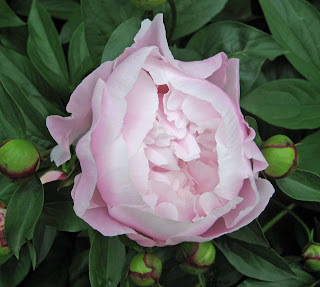 Now that you know a bit about the history of my peonies, I hope you’ll stay just a minute or two longer and see some more pictures of them. A peony bud about to open. A group of peonies at various stages of opening. 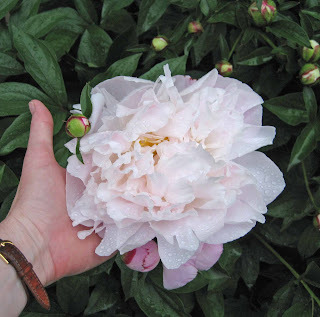 A peony in my hand to show you how big the flowers are. A peony in the rain this evening. A peony in the evening yesterday. Thanks for 'staying' with this post long enough to enjoy my peonies. I'm just sorry you can't smell them, too. Your collection of peonies are just gorgeous Carol. You have the added delight of having some from your Dad's garden. You are a lucky lady. 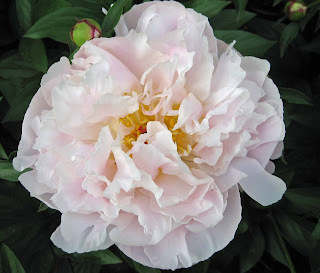 I'd rather be tortured by wonderful photos of peonies and not have any to smell, Carol, than not see them at all! That huge softly ruffled flower in its lovely shades of pale pink, is just as beautiful as when you told their Passlong history two years ago - but it might already have a name... isn't it a 'May Dream'? Ooh--thanks for posting more peonies! They are gorgeous--and now I'm wishing I had a few more in my garden. I'm still waiting for my 'Sarah Bernhardt' to bloom. The only good thing about it not blooming yet is that just as the lilacs are fading, I'll have the scent of peonies to replace them! I do love Peonies and who couldn't they are practically perfect! Especially the ones with fragrance! 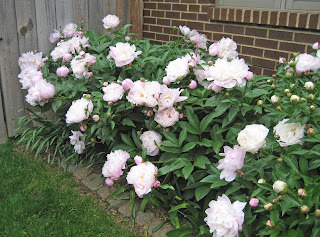 Thanks for sharing your Father's peonies with us Carol. Your post brought back so many memories. The pineys(southren In) and taking them to the cemetary with grandparents-a ritual never to be missed. I have no heirloom plants, sadly, but do try to grow the ones I remember from loved ones gardens. It's nice to know others do the same. They look so big and fluffy. I can imagine making them into a fragrant pillow for daydreaming the afternoon away. Your Peonies are beautiful, Carol. I've been thinking about growing them for years since they are supposed to be deer resistant which is our biggest problem. We don't have a rabbits here just deer munching on anything beautiful and in bloom! 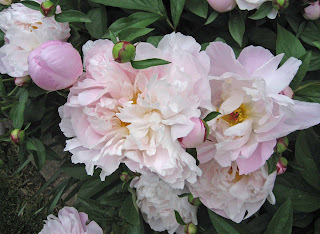 Thanks to your beautiful pictures, I'm putting Peonies on my list of garden 'things to do'. Ohmigosh, Carol, these are just gorgeous! I don't have any peonies, sadly, but my mother and grandmother used to. Hmmm, I may have to check and see if she still has some to get some divisions from her. I think you're right--the old heirlooms are the most beautiful. Sure thing. I enjoyed the Peonies. I think the best plants are the ones we get form our parents and family. Pretty peony! Your post brought back memories of the ongoing struggle (it wasn't quite a battle) between my mom & grandma (her mother in law). My mom had Peonies at our first house. My parents sold that house while our new house was under construction. Before we moved into a rental house, my mom dug up all her Peonies & planted them at my grandma's house for the interim. My grandma misunderstood (I think deliberately), insisting that the Peonies were hers. She refused to divide them or give them back. My mom eventually gave up & bought herself new Peonies. I wish I had plants in my garden that were passed down to me. That would be so special. But I could just imagine trying to grow the same things as my Mother. She lives in the western mountains in zone 4 (basic soil) and I live close to the Atlantic in zone 6 (acidic soil). I think our only plants in common are lilacs and irises. Lisa at Greenbow, thank you, I do feel fortunate to have these peonies. The Garden Fairie, I hope you didn't get a frost last night! Annie in Austin, What a wonderful idea, to call these 'May Dreams'. Thanks for thinking of it. Colleen, I think I'm just a week or so ahead of you, as my lilacs are fading, in time to give the peonies center stage. Gail, I agree, they are a great flower and any gardener who is where they will grow should include one or more in their garden. Beckie, I often buy flowers because of some connection to my past. I think we all do! Pam/digging, That's a great idea. It wouldn't take too many of these big blooms to make a pillow out of them. Karen and Ralph, Since we have no deer in my neighborhood, I don't know if deer leave them alone, but they are definitely worth trying. Rose, Yes you should go and get divisions from your mom! Karen, I know what you mean, when I see the picture, I can imagine the smell, too. 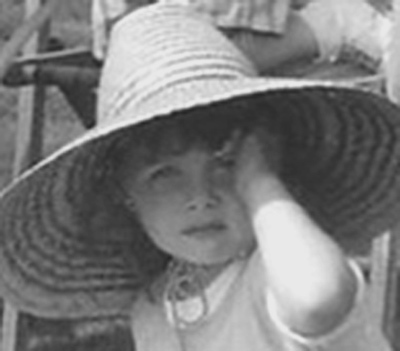 Mr. McGregor's Daughter, what a story! Your grandma needs to learn gardener's math... that by dividing plants we multiply them. Daphne, You might be right on the plants you and your mom have in common. Thanks all for taking time to enjoy my peonies and leaving a comment! Carol - not "May Dreams" but 'May Dream'. I have no idea why, but it needs to be singular! Annie, Singular it shall be! It is now known as 'May Dream'. I took some and put them on Dad's grave on Monday. I never knew that about cutting the side buds. I wonder if he would be disappointed in the one I took him?